DO YOU OFFER TICKETS OR DISCOUNT TICKETS FOR THE HALLOWEEN HAUNT? No. This website is an UNOFFICIAL website for the Halloween Haunt. We do not handle any sort of ticket sales or discounts on the website. Please visit Knotts.com to find the information you’ll need to purchase tickets. IS ULTIMATEHAUNT.COM AFFILIATED WITH KNOTT’S BERRY FARM OR CEDAR FAIR? No, we are not affiliated with Knott’s Berry Farm. The opinions you read on this website are our own and completely separate from those of Knott’s Berry Farm. If you would like more details, click here to read our disclaimer. HOW OLD DO YOU HAVE TO BE TO WORK THE HALLOWEEN HAUNT? According to Knott’s Berry Farm, you need to be at least 18 years of age OR carry a GED or High School Diploma. HOW DO I BECOME A MAZE DESIGNER FOR THE HALLOWEEN HAUNT? Good question! When you find out, let us know! Actually, becoming a Haunt Maze Designer seems pretty tough. Your best bet is just to try and contact Knott’s Berry Farm directly. WHAT GEAR DO THE SLIDERS USE TO SLIDE ON? You will not find out answers to those types of questions on this website. If Knott’s Berry Farm decides to make the slider gear public, then at that point we may consider releasing the information. In other words, just be scared/entertained by them and don’t bother asking WHY…just accept it as is. If you are running your own Halloween themed event and want your own sliders, well, you’re on your own. HOW DO I SEND MY HAUNT PICTURES TO YOU? Easy! Just email your picture(s) to webmaster@ultimatehaunt.com and once we get them, we’ll do our very best to find a place for them somewhere on the website. Obviously, we are looking for certain kinds of pictures. First off, please send them as jpg files and at around 72 dpi. Secondly, take a few moments to browse our Gallery of pictures. The pictures located in our Gallery are the types of pictures that we wish to continue to publish. We cannot publish pictures that display poor or crass behavior as well as Knott’s Berry Farm “backstage” photographs. We also try to publish fairly clean images on the website, so if your pictures did not come out well in the fog, you might want to try and skip sending those. WHEN DOES KNOTT’S BERRY FARM RELEASE THE INFORMATION ON THIS UPCOMING HALLOWEEN HAUNT? Your guess is as good as ours. The information being officially released seems to vary from year to year. Some years the information is released in August while other years it is released in September and most recently, in July. We will publish the information as soon as we get it in our NEWS section. WHAT MUSIC DOES THE HALLOWEEN HAUNT USE FOR THEIR MAZES? 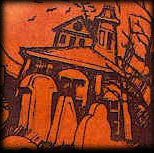 A listing of the music from the Haunt’s history can found on this website by clicking here. WHEN IS THE NEXT ULTIMATEHAUNT.COM UPDATE? Ultimatehaunt.com is updated throughout the entire year. For obvious reasons, the more frequent updates are during the months of August – November. We try to update at least once or twice a month, but if we run behind, we encourage you to enter your email address into our email list. By being a part of our mailing list, you will be emailed everytime the website has notable updates.